The pilot in command (PIC) of an aircraft is the person aboard the aircraft who is ultimately responsible for its operation and safety during flight. 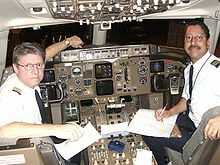 This would be the captain in a typical two- or three-pilot aircrew, or "pilot" if there is only one certificated and qualified pilot at the controls of an aircraft. The PIC must be legally certificated (or otherwise authorized) to operate the aircraft for the specific flight and flight conditions, but need not be actually manipulating the controls at any given moment. The PIC is the person legally in charge of the aircraft and its flight safety and operation, and would normally be the primary person liable for an infraction of any flight rule. The strict legal definition of PIC may vary slightly from country to country. The International Civil Aviation Organization, a United Nations agency, definition is: "The pilot responsible for the operation and safety of the aircraft during flight time." Flight time for airplanes is defined by the U.S. FAA as "Pilot time that commences when an aircraft moves under its own power for the purpose of flight and ends when the aircraft comes to rest after landing." This would normally include taxiing, which involves the ground operation to and from the runway, as long as the taxiing is carried out with the intention of flying the aircraft. The pilot in command of an aircraft is directly responsible for, and is the final authority as to, the operation of that aircraft. In an in-flight emergency requiring immediate action, the pilot in command may deviate from any rule of this part to the extent required to meet that emergency. Each pilot in command who deviates from a rule under paragraph (b) of this section shall, upon the request of the Administrator, send a written report of that deviation to the Administrator. U.S. FAA FAR 121.533(e) gives broad and complete final authority to airline captains: "Each pilot in command has full control and authority in the operation of the aircraft, without limitation, over other crewmembers and their duties during flight time, whether or not he holds valid certificates authorizing him to perform the duties of those crewmembers." The pilot-in-command of an aircraft shall, whether manipulating the controls or not, be responsible for the operation of the aircraft in accordance with the rules of the air, except that the pilot-in-command may depart from these rules in circumstances that render such departure absolutely necessary in the interests of safety. The pilot-in-command of an aircraft shall have final authority as to the disposition of the aircraft while in command. Both FAR 91.3(b) and ICAO Annex 2, par. 2.3.1, specifically empower the PIC to override any other regulation in an emergency, and to take the safest course of action at his/her sole discretion. This provision mirrors the authority given to the captains of ships at sea, with similar justifications. It essentially gives the PIC the final authority in any situation involving the safety of a flight, irrespective of any other law or regulation. Under U.S. FAA FAR 14 CFR 61.51, logging flight time as a PIC is different and distinct from acting as the legal PIC for a flight. In general, the PIC of a given flight may always log his or her flying time as such, while other crew members may or may not be authorized to log their time on that flight as PIC time, depending on the specific circumstances and the controlling jurisdiction. ^ "Part 1 DEFINITIONS AND ABBREVIATIONS". October 12, 2012. Archived from the original on October 24, 2011. Retrieved 2013-03-15. ^ "CFR Title 14 Part 1 Section 1.1". U.S. Federal Government. Archived from the original on 1 August 2015. Retrieved 26 March 2015. ^ "U.S. FAA FAR 91.3: Responsibility and authority of the pilot in command". Archived from the original on 2014-09-14. Retrieved 2006-10-20. ^ "14 CFR 121.533 - Responsibility for operational control: Domestic operations". LII / Legal Information Institute. Retrieved 3 May 2018. ^ "Title 14: Aeronautics and Space: §61.51: CERTIFICATION: PILOTS, FLIGHT INSTRUCTORS, AND GROUND INSTRUCTORS – Pilot logbooks". Code of Federal Regulations. United States Federal Aviation Administration. Archived from the original on 2011-06-13. ^ Fried, Howard (1997). Beyond The Checkride. McGraw-Hill. pp. 101–111. ISBN 0-07-022468-4. Craig, Paul A. (2000). Pilot in Command. New York: McGraw-Hill. ISBN 0-07-134844-1.